If you are looking for a simple upper body workout to build hard muscles then look no further! Most guys are looking to pack on bigger muscles to their torso and do so in a way that isn’t complicated or time consuming. In my experience, sometimes the classic approaches to building muscle are often the best. This article will explore three basic exercises that you should consider including as part of your upper body workout routine on a weekly basis. The moves are simple and will help you blow out your torso in a simple, easy to follow format. Some of these upper body exercises can be performed at home while others require that you visit your gym. Our focus will be on the pectoral muscles, latissimus dorsi muscles and shoulders muscles. So are you ready to build an impressive upper body physique? Let’s take a look at the workouts! 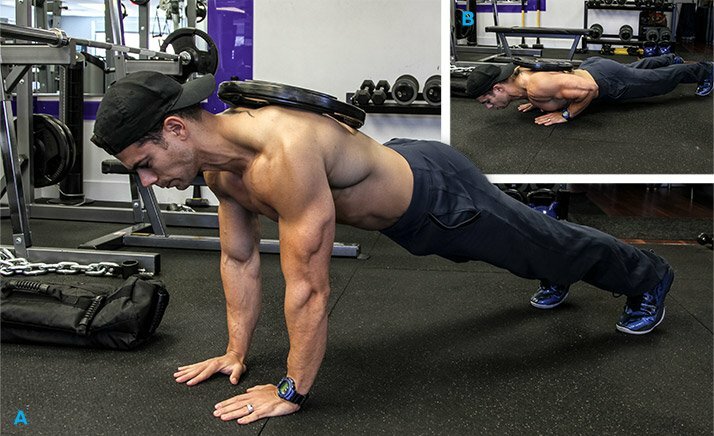 One of the best overall exercises you can do to help build muscles in your chest, arms, shoulders and back is the pushup. To give your upper body a little extra kick, consider doing the weighted version of this exercise. Get on the floor and assume the standard push up position. This means spreading your hands about shoulder width apart with your hands extended. Keep your back straight. Take weight plate (start out with 10 – 25 LBS) and place it on your back. If you have difficulty with this, ask a gym buddy or friend to put the plate on your back, centering the weight between your shoulder blades. Keeping your upper body as straight as possible, slowly lower yourself by bending your elbows until your chest is about 1 inch from the floor. Now pause. Slowly and deliberately push yourself back up. A simple and classic upper body exercise. When you think about it, bench presses are the foundation of a rock hard chest. The barbell bench press helps to shred the major pectoral muscles and as an ancillary benefit, grow the shoulders and arm muscles. Lay down on a flat-bench and grab the barbell with an overhand grip that’s just a little more than shoulder width. While lying down on the bench with your feet flat on the ground, lift up the bar and hold it above your sternum with your arms straight. Slowly lower the bar until it is about 2 inches from the middle of your chest. Pause. Gradually lift the weight back up to the starting position, making sure you squeeze at the top. Muscles Worked: Pectoral, Shoulder and Biceps. A really great exercise that will help give your upper body more girth is the single arm dumbbell row. This particular exercise move works out the lateral muscles, pectoral muscles and to a lesser degree, the triceps. If you are looking for exercises to help fill out your t-shirt and give you more of a V-Shape appearance, toss this one into your weekly workout plan. It is best to start out with a light weight barbell so that you get the form right. Grab a barbell in your left hand with your palm facing inward towards your chest. Bend your knees and hips and slowly lower your torso. Allow the dumbbell to hang from your shoulder. This is your starting position. Now, slowly and deliberately pull the dumbbell to the side of your torso. Keep your elbow tucked fairly close to your side. Squeeze. Now slowly return the weight back to the starting position. No upper body looks complete unless you throw in some killer arm exercises that are complimented by defined, six pack set of abs. You also want to have a great back. Ultimately, you are going for a total upper body workout that includes chest, back, shoulders, traps and arms. And don’t forget those legs! If you are new to body building and strength training or if you are looking for a quick refresher on some of the basics to building an impressive upper body, consider grabbing a copy of 21 Days to a Bigger Chest by Grant Michaels. In this read, you will find a number of practical moves that you can do at the gym or at home. If you dug this article, please Like on Facebook. There is an entire page on leg workouts Throg. Not sure if you saw? Haha. I hadn’t been to this site before. It was just a dumb joke. saves your elbows unlike skull krushers! Thanks for sharing this tip! Very helpful to readers. And yes, skull crushers have a bunch of issues connected with it – including elbow problems. I did these a few weeks ago and know exactly what you mean.